Suicide is a very complicated public health issue, influenced by demographic characteristics, socioeconomic factors, as well as health- and crime-related factors. Since the Great Financial Crisis (GFC), a tsunami of suicides has swept across America, making it the tenth leading cause of death, and in 2015, accounted for more than 44,000 deaths. Understanding the geographic patterns of suicide can better inform the nation that something is not quite right. Although government researchers have presented state-level trends in suicide rates, data at the county-level has been widely overlooked. The ‘County-Level Trends in Suicide Rates in the U.S., 2005–2015‘ report, issued by a team of researchers from the Centers for Disease Control and Prevention (CDC) used county-level changes in suicide rates to examine geographic trends and identify urban-rural patterns in these type of deaths from 2005 to 2015. The animation above, created by The Washington Post from figures in the report, shows a never before seen explosion in suicide rates at the county level during the period. Researchers said suicide rates increased by more than 10 percent from 2005 to 2015 for 99 percent of the counties across the nation, with a shocking 87 percent of counties registering increases of more than 20 percent. 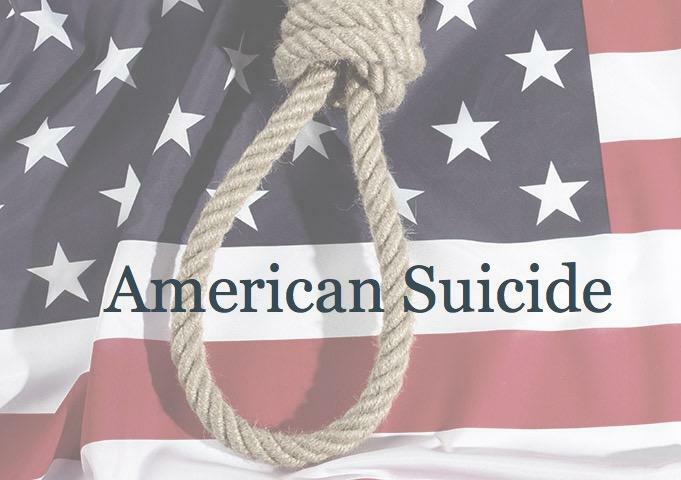 “The highest [suicide] rates across the period were seen in parts of Alaska, Arizona, northern California, Colorado, Idaho, Montana, New Mexico, Nevada, North and South Dakota, Oregon, and Wyoming,” the report discovered. By contrast, the regions with the lowest suicide rates were consistently seen across southern California, Connecticut, Massachusetts, New York, Rhode Island, New Jersey, along the Mississippi River, western Texas, and along the eastern coast of North and South Carolina. 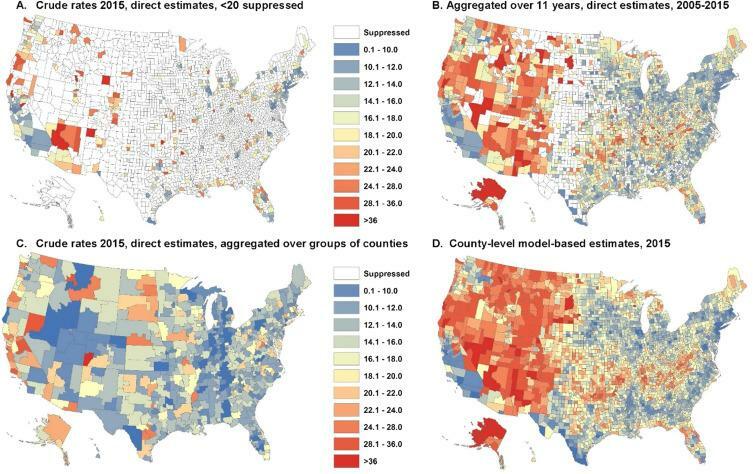 Comparison of model-based versus direct estimates aggregated over larger geographies, or over 2005–2015. 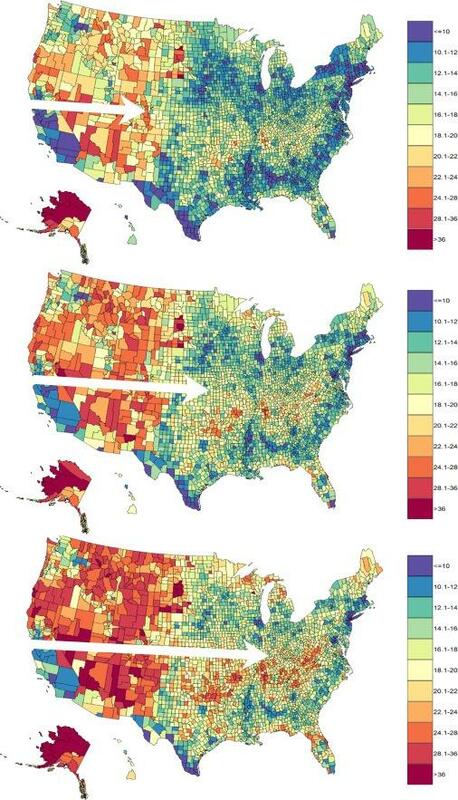 Model-based county-level suicide rates in the U.S., 2005 (top), 2010 (middle), and 2015 (bottom). Researchers note that suicide rates in rural counties are complicated to measure, however, for this study, statistical modeling methods to infer suicide rates for smaller counties, along with 50 sources of data helped to develop the most accurate estimate of suicides, to date. Suicide is now the 10th leading cause of death in the nation. The research presents an unprecedented view of the implosion of America. Judging by the trajectory and, of course, momentum, it is only a matter of time before the wave of death strikes the East Coast.